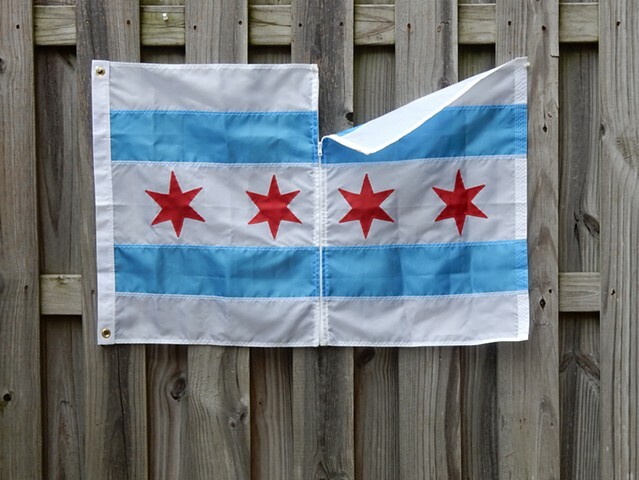 CITY OF CHICAGO flag (nylon) with brass grommets, and zipper. Informed by Chicago’s position of non-compliance with the U.S. Dept. of Justice's new rules requiring sanctuary cities nationwide to cooperate with immigration agents in exchange for receiving public safety grant money. CHICAGO- Nov. 13, 2016, Chicago Dept. of Public Health: “Since the Presidential Election, there has been a sense of uncertainty among many immigrant communities in Chicago and across the nation. I want to assure all of our families that Chicago is and will remain a Sanctuary City,” said Mayor Emanuel. “Chicago has been a city of immigrants since it was founded. We have always welcomed people of all faiths and backgrounds, and while the administration will change, our values and our commitment to inclusion will not."